The aging population of the developed countries, coupled with a desire of the workers for fewer hours, is a ticking time-bomb. The Proprietorship and Partnership sector will be tremendously impacted in the coming decades because of the tectonic shift in the employment scenario. There is an urgent need for society to calibrate this explosion in the coming decades, says R. Vaidyanathan. IT IS often mentioned that demography is destiny. There has been a debate about demographic trends in India as revealed by the 2001 Census. Equally interesting developments are happening in the demography of developed countries, which will have far-reaching implications for us, particularly for the Proprietorship and Partnership (P&P) sector and the households. The age bomb is ticking in the West. It will significantly affect the “white-collar workforce” there. In the next few decades, there is going to be an explosion in outsourcing’ or `offshore’ work, since onshore work creates what is politely called social costs’. A look at the possible demographic profile of Europe and the US in the next few decades taken from UN population projections. In 2000, the average total fertility rate in the developed countries was 1.57, and in the developing countries 3.05. The rate for Europe is 1.4 and 1.3 for Japan. The US is at just 2.1, India at 3.1 and China at 1.72. It is felt a rate of 2.1 is an appropriate replacement rate, including some death of infants. Over the next decade, the situation could worsen. Estimates suggest that in the next 50 years, the US will grow by 100 million numbers and Europe will be less by 100 million numbers. For instance, in another 40 years, the German population would be less by nearly 30 per cent. One-third of the population will be more than 65 and will outnumber children two to one. Italy’s rate is 1.2, and in that Catholic country, in another 40 years, more than 40 per cent of the population will be above 65 years. In Russia, two out of three pregnancies are terminated before birth, and the women average 2.5-4 abortions each, and their death rate is 70 per cent more than the birth rate. The Russian President, Mr Vladimir Putin, warns that in 15 years there will be 22 million Russians, that is, seventh of its current population. Japan is already facing the age crisis. Of course, the Caucasians in England are not having enough children, with London readying to have “ethnic majority” in a decade. One can go on. The aging of the developed countries, coupled with a desire of the labour class including white-collar workers, to work for lesser hours, is creating a catastrophe. Figure 1 represents the age structure — that is, number of people in different age groups. 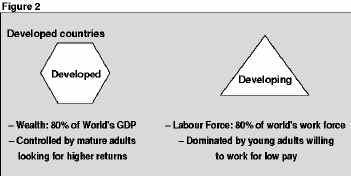 The developed countries with a hexagonal age structure are slowly moving into trapezoid or inverted pyramid-shaped structures. 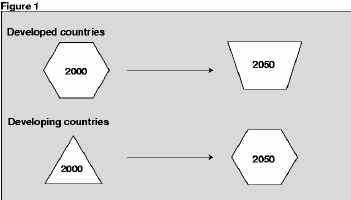 In the case of developing countries, they will move from a pyramid age structure to, perhaps, the hexagonal structure. This is the nature of the crisis. The labour force will be extremely scarce and expensive in the developed world. The elderly will also demand better protection, and the state will spend all its money to become the new caring `child’ for these old people. Since societal norms (in terms of caring for the elderly by the off-springs) have gone for a six, the aged are the responsibility of the state, and this implies more taxes and a lesser amount available for other activities of the State. Hence, there is a massive crisis in “social security” funds in Europe and the US. It is not only an issue of low wages; it is the pool of talent available in a country such as India. The role of this demographic pattern has some interesting results (Figure 2). Again, there are several layers of this pool and so no worry of it over-pricing itself. Indian youngsters in this IT world are enthusiastic and willing to put in 70-80 hours, including Saturdays and Sundays. That is a story which is yet to be written. The story of sacrifice, work culture and simply `enthu’ to get things done. Another issue relates to the increasing content of the `outsourceable’ portion in many activities. In service sectors such as banking, it is more than 60 per cent, including software/voice/audio, etc. In some of the manufacturing activities, the software content is more than 30 per cent. This would induce large firms to go in for more and more outsourcing. Already, we find that the remittances by the labour of developing countries at more than $70 billion is higher than the net private capital flows from the developing to the developed countries at around $65 billion. This is primarily flow from blue colour workers from West Asia, the US, and Europe to other parts of the world. This will undergo an interesting shift, since by the process of outsourcing, the labour will not move, only the work will move. Offshore work centres are increasing exponentially. Thousands of young men (and, of course, women) are already found in cities such as Chennai, Bangalore, and Gurgoan with plastic identity cards around their necks (men with mangalsutra or MWM) doing the work for those old persons mentioned earlier. The `offshore’ centres are slowly shifting to smaller towns to bring down wages, as also to tip a larger pool of youngsters. The P&P sector will be tremendously impacted in the coming decades because of this tectonic shift taking place in employment scenario of young persons. Companies manufacturing for the domestic market are already finding it difficult to get capable youngsters who prefer the IT sector. It will substantially increase the cost of domestic labour in these activities to `dollar’ levels. Plus the impact on infrastructure. There is a tremendous need for society to calibrate this explosion in the coming decades. Remember that the unemployment rates for the below-25 age group are 30 per cent for Italy, 21 per cent for France, 9 per cent for the US and 12 per cent for the UK in last few years. Now, the issue is the reaction of the “Aged Empire” to these developments. Hence, this would make nation-states in the West unhappy with the global corporations as already seen in the Kerry campaign and the legislation to `control’ outsourcing in many States. In 2001, the developed countries imported $250 billion more merchandise than they exported and the US imported $435 billion more. China’s share in some segments of the American market (such as toys, sports goods, camping gear, household items) was more than 60 per cent. Developing countries were net exporters with $165 billion more merchandise export than import. So, the process of globalisation has created a severe twist in the Western tail. This gives rise to the following possibilities. One is to encourage a large inflow of such skilled professionals into these countries from India, but the events following 9/11 are proving that this is not the solution the US or Europe are going to adopt. Hence, there could be lot of noise about “security issues” in outsourcing and there may be demand that Indian labour be screened by American security before being employed in BPOs. This would create a pool of RNIs (Resident Non-Indians) who live in India but hold US greencard of “security cleared category”. One need not be surprised that in a few years there will be huge pool of young men and women who are “US security cleared” (USC) but living in India. This will create a “sub-divide” within the digital divide. Large areas of land are needed to create these offshore centres and already farmers on the outskirts of Bangalore have held agitations seeking “fair price” for their land. One possibility is to treat their land as an equity investment and provide them long-term benefits in the form of share in profits. Since most farmers do not possess interchangeable skills to be fruitfully employed elsewhere, social cohesion will be established. Time has come for agencies such as Nasscom to ponder over these issues. Will it be on our terms? The other issue is regarding the culture, language, eating habits, family values of these mass of men and women. Already, there are several reports to suggest that fast-food is the norm and casual attitude to family is seeping in the system of these youngsters. Of course, there are arguments about India moving up the value chain in all these cyber activities. That could take place, but in this business where `knowledge’ is the capital, it is always easy for large corporations to buy persons at an attractive rate. Hence, our efforts may not bear fruit in the `traditional’ sense. Civil society needs to debate the issues and calibrate the change since Indian society has always dealt with challenges in a spirit of tolerance and evolution and, sometimes, lost out. Hence, we need to be proactive and let the world chew in its old age juice! For at least 40 years, the global cycle is ours, simply because no one else, including China, has numbers, language and skills. And, of course, the other neighbour, Pakistan, is more known for the export of the other IT, namely international terrorism. Let the holiday, attitude, language, manners, culture and work issues be dictated by us, namely the global back office. Thomas Babbington Macaulay, English historian and author, English historian and author, mentions about creating men with Indian body and British Souls but in the emerging scene, unless we are alert , we may end up with men with no soul and obese western bodies due to fast-foods.